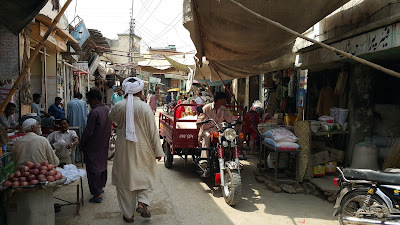 Geotagging historically or culturally important places of Pakistan. Publishing their pictures and exact locations, along with some details. And the topics related to the history of Pakistan. It was a dream came true, when Muhammad Ali Assad Bhatti, finally got a chance to visit India in 2003 to attend a literary event, Punjabi Language conference in Chandigarh. Besides other things, he was very excited to meet Khushwant Singh, his friend. 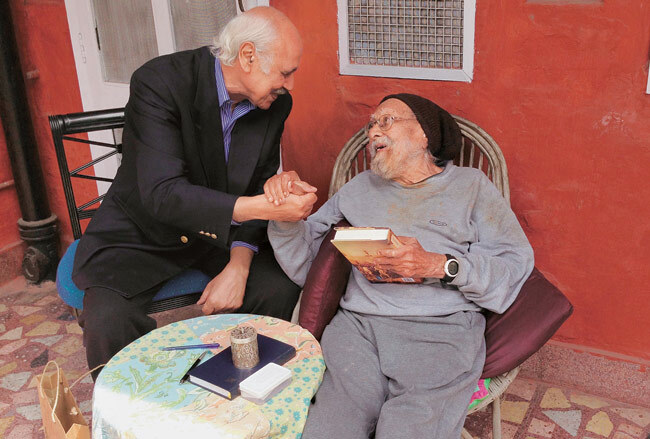 Asad did not have his mobile number, so when he called Khushwant Singh at his home in New Delhi, he was not there. However, the organizers of the event tracked him down to be in Simla. So far it was good, but when he finally established a contact with him, something unexpected happened. As soon as he introduced himself to Khushwant Singh and told him that he had come from Hadali, first there was a complete silence and then Khushwant Singh hung up the phone. Asad was hurt and deeply embarrassed in front of his companions, a person whom he claimed to be his friend, did not bother even to talk to him. For the next few hours, Asad Bhatti remained in a dejected mood. 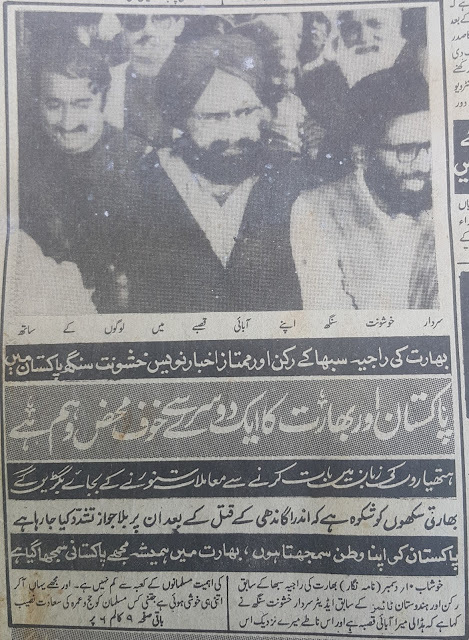 In the evening, suddenly to the surprise of everyone Khushwant Singh reached the hotel, the venue of that conference and asked about Asad Bhatti. As soon as he saw Asad he embraced him tightly with tears in his eyes and said "Bhatti you must be hurt that I closed your phone and did not talk to you. Actually, when I heard that you came from Hadali, I could not control my self." This is how Khushwant Singh met his friend from Hadali, a small town in district Khushab. I would not write about Khushwant Singh or his works, not only that it is unnecessary because of his fame all over the world, it is also impossible for me to do justice to that subject. I shall write only about his connection with Hadali and his love for his birthplace and its people. He was born in Hadali on 2nd February, 1915 into a prominent and wealthy Sikh family. His father Sardar Sobha Singh was a successful builder and contractor in New Delhi. He also moved there in his early childhood. He did his graduation from the Government College Lahore. 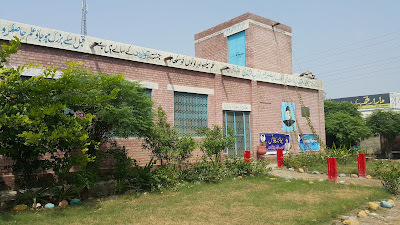 After completing his education he lived for almost a decade in Lahore until 1947. Where he practiced law. During his long literary career Khushwant Singh, who was a prolific writer, gained a great fame due to his style, openness and diverse subjects of writings. He wrote on social issues, history and politics. But his satire and humour probably were among his most popular and admired works. 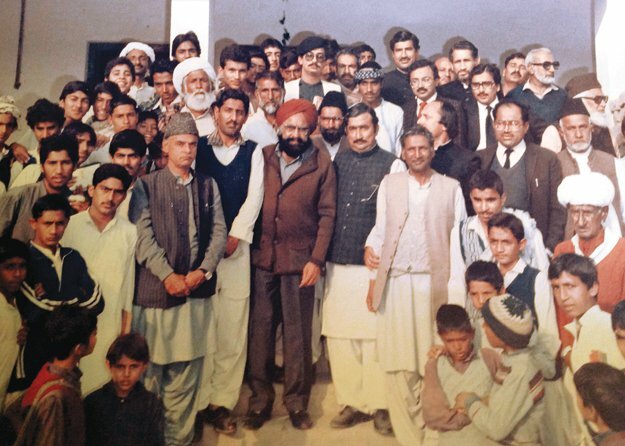 After the partition of India, Khushwant Singh remained in touch with his friends and visited Pakistan a few times. He probably came to visit Pakistan the first time in 1977. As a journalist, he came to cover the hanging of Zulfiqar Ali Bhutto. I remember reading a book of his articles and one of them was about the hanging of Bhutto. 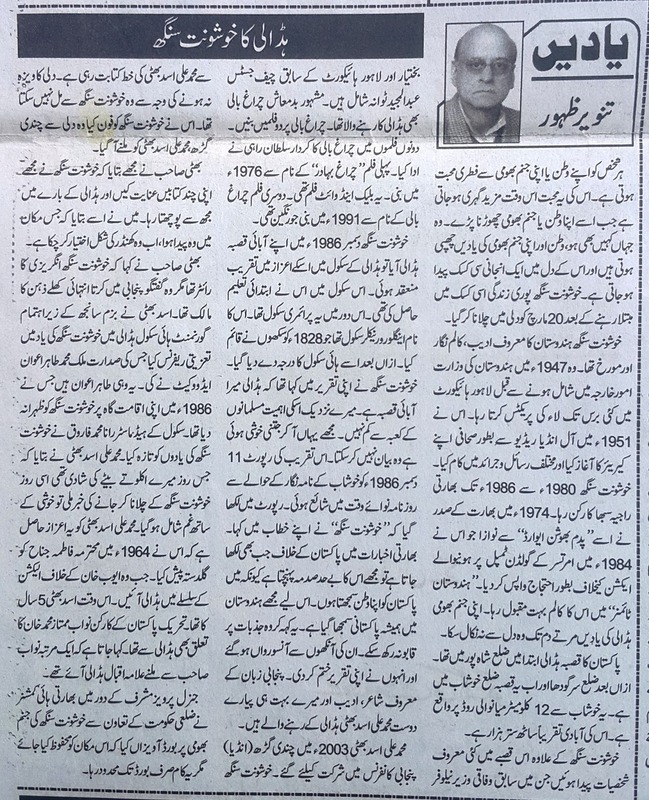 That is no doubt is the best article which I have ever read on this subject. In Pakistan, his most well known work is "Train to Pakistan". A novel which is now considered a classic. 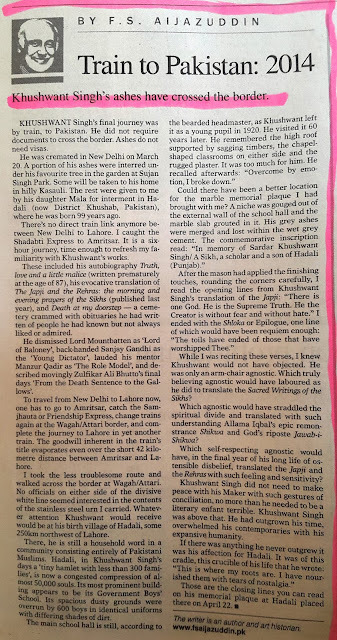 My story about Khushwant Singh and his attachment with Hadali, his birthplace, starts in 1984 or 1985 at Bahrain Airport. He was standing in front of the immigration officer, who was checking his passport. The officer looked at the passport keenly and then to the surprise of Khushwant Singh asked him to step aside. He had an even bigger surprise in store for Khushwant Singh. He questioned Khushwant Singh that was he born at Hadali in district Khushab, as written on his passport? 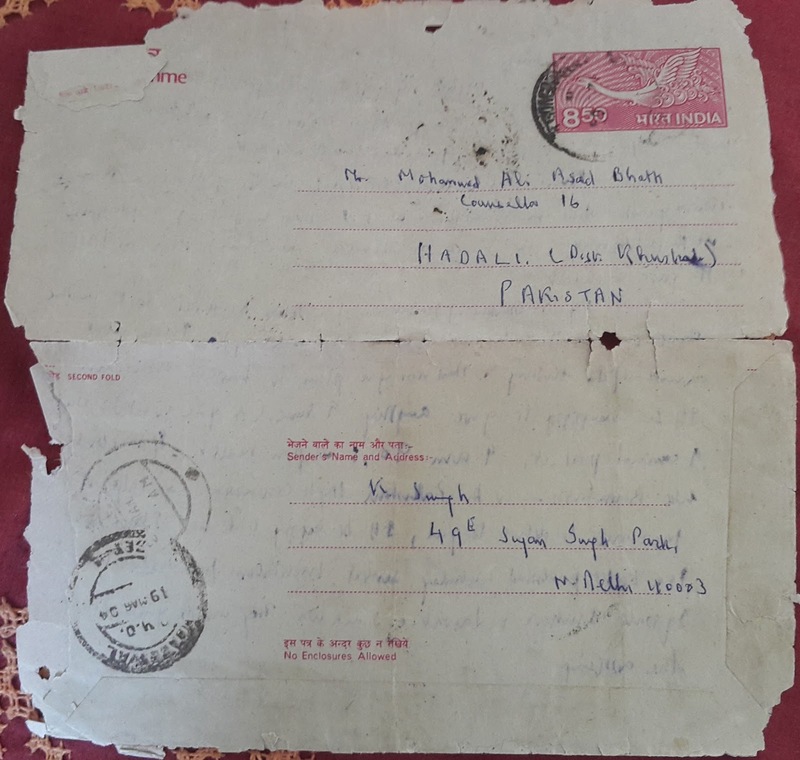 When Khushwant Singh replied in affirmative, Malik Ahmad Nawaz Awan, the immigration officer, informed him that he too belonged to Hadali. And this is how Khushwant Singh re-established his long severed link with Hadali. It was then a there that Khushwant Singh decided to visit Hadali as soon as possible. He soon got an opportunity to fulfil his long desire, when he came to Pakistan to attend the wedding of his close friend Manzoor Qadir's son. Manzoor Qadir was a famous jurist and foreign minister of Pakistan. When I first time visited Hdali on 30.08.2017, I was not acquainted with Asad Bhatti. I simply went there to find something related to Khushwant Singh. 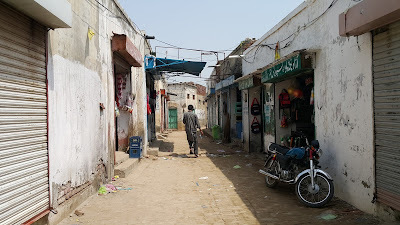 On the main road a shopkeeper told us that if we wanted to know something about Khushwant Singh, we should meet Asad Bhatti. So we reached the house of Khushwant Singh, about half a kilometer outside the town. He welcomed us warmly and told us many details about Khushwant Singh's association with Hadali and his own friendship with him. 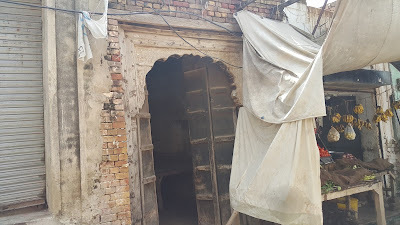 He also took us to the place, where the home of Khushwant Singh once existed. 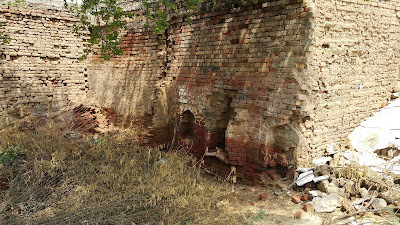 Unfortunately, now only partial ruins can be seen. The house was divided among a few migrant families. 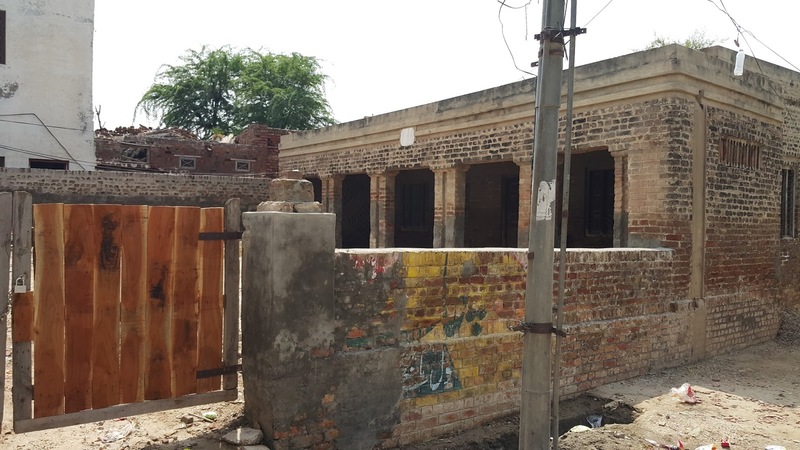 It was located at 32°17'30.40"N; 72°11'25.10"E. He also took us to the High School and showed us the commemorative plaque of Khushwant Singh. Its location is at 32°17'36.58"N; 72°11'17.18"E.
However, when I thought of writing something on this subject. I realized that the information I collected in Hadali was not enough and too many links found to be missing. My memory also failed me. So I planned to meet Asadi Bhatti once again. And that opportunity came nearly two years later on 7 July, 2017. After such a long time and due to brief meeting the last time, Asad Bhatti sahib had completely forgotten me. This time, however, I took notes a little more carefully. Home of Khushwant Singh. 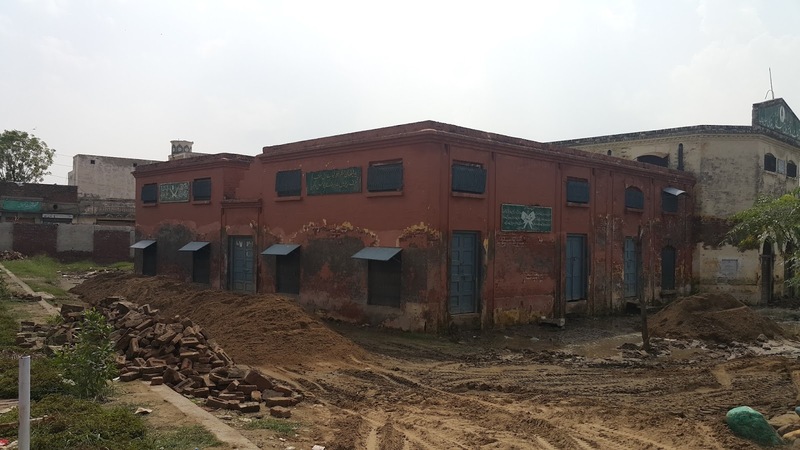 Photo provided by Asad Bhatti. Now something about Muhammad Ali Asad Bhatti. He was born in Hadali in 1960. He did his matric from the Government High School Hadali and then joined the army in 1979, where he served as a wireless operator and retired as a Havaldar (Sergeant). Due to his literary bend of mind, his unit officers regularly appointed him to arrange unit events, like stage dramas etc. He retired in 1996. Due to his interest in literature, Asad Bhatti already knew Khushwant Singh and had read some of his works. But he did not know that this great writer was born in Hadali, his own hometown. He also could not meet Khushwant Singh when he came to Hadali in 1986, as he was away serving in the army. When he learned about this visit, he decided to establish contact with him. He wrote his first letter to Khushwant Singh in 1990. 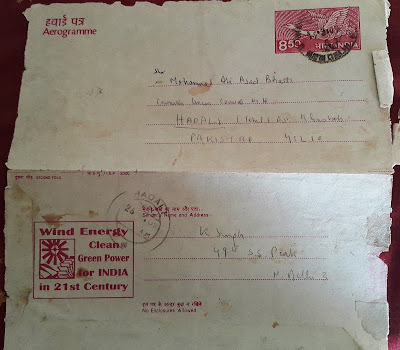 He did not have his address and simply wrote Khushwant Singh, Delhi, India. Though he did not have high expectations of receiving a reply, to his surprise and delight, he received one within a month. 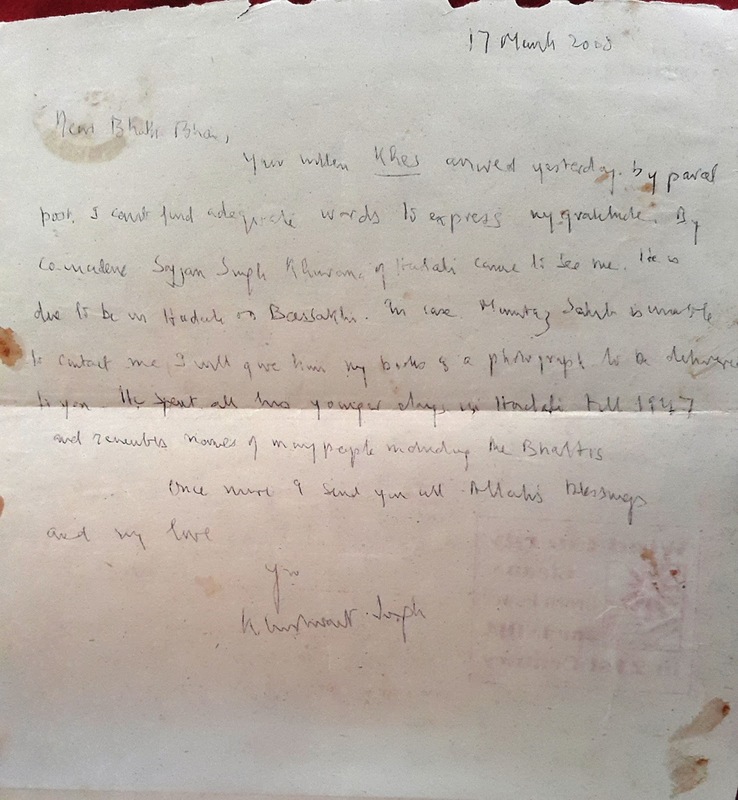 Thus started a pen friendship through letters which lasted until the very end of the life of Khushwant Singh. Asad always wrote in Urdu and Khushwant replied in English. Back then it was not easy because Asad Bhatti was still serving in the army and it raised eyebrows in some circles. 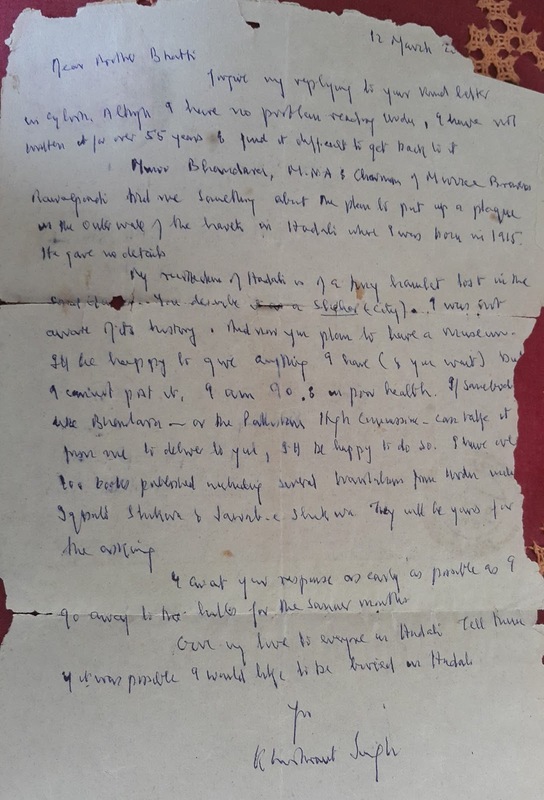 In all, he received about a dozen letters from Khushwant Singh. 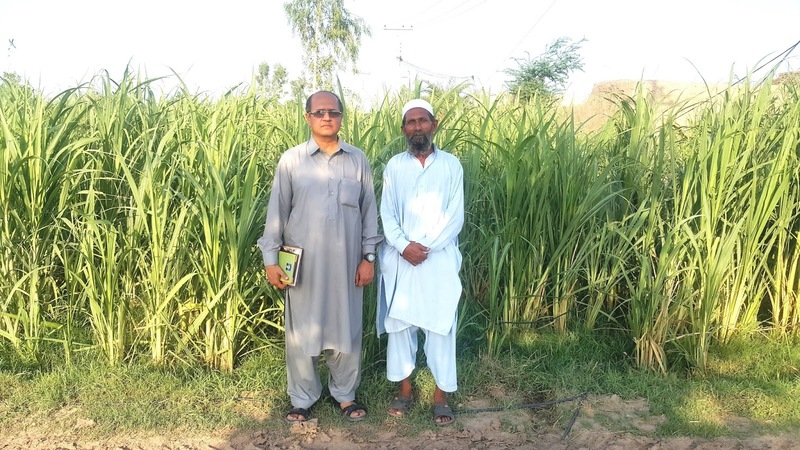 Asad Bhatti owns a few acres of agricultural land at the outskirts of Hadali and lives there in his simple house. He may be a man of limited resources but possesses a great soul, mind, and sense of self-respect. 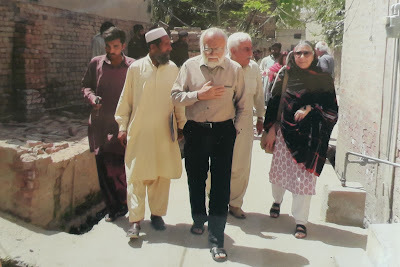 I was so impressed by his dedication and sincerity that I decided in my mind that this post was going to be not only about Khushwant Singh but his friend Asad Bhatti also. How he feels about Khushwant Singh and his friendship with him? Let us read it in his own words. 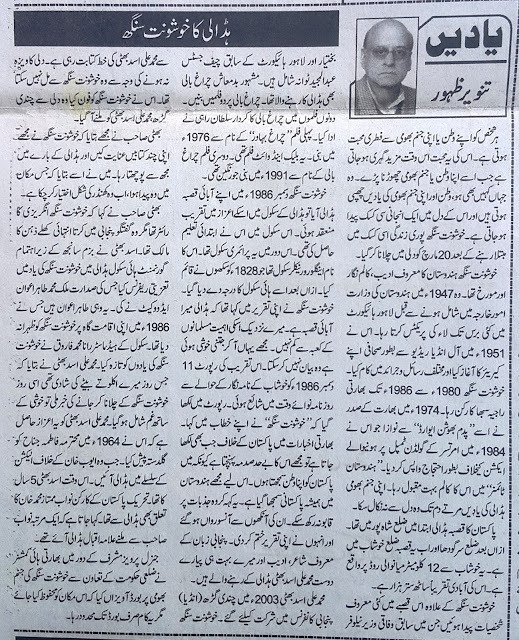 Asad Bhatti Wrote this article in Urdu. I translated it into English. I am not sure how good it is, but believe me, it is much better than the "google translate's". Every person naturally loves his own country or his birthplace. Because it is natural for a man to love the soil of which he is made and his love or spiritual relationship grows more, when due to circumstances he has to leave his homeland or birthplace. Wherever, he may go or make any country his permanent home, the memories of his homeland remain hidden in the depth of his heart. And a longing and tormenting feelings arise in his heart about the memories of his homeland. Its value is understood only by that person, who has passed through these circumstances. These memories are his valuable asset. 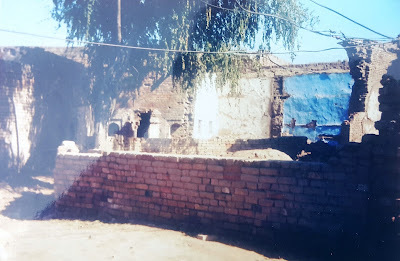 Khushwant Singh was a same kind of a man, who loved his ancestral homeland to an extreme and his soul kept circumambulating Hadali, his birthplace, till his death. Physically Khushwant Singh remained in India but his soul always kept wandering in Pakistan. His love for his homeland can be seen by the fact that he often expressed his desire that he should be buried at his birthplace after his death. (It is mentioned in his letters to the writer) He knew that due to the Indo-Pak relations it would not be possible, but even if a fistful of ashes of his funeral pyre are buried in the dust of Hadali, his wish would be fulfilled and his soul would rest in peace. After his death, in honour of his wish and not to let down his soul, his son Rahul Singh, daughter Mala and his friend Fakir Syed Aijazuddin, brought his ashes to his birthplace, Hadali, for burial and hence fulfilled his last wish. I have seen this much love for someone’s birthplace, to the extent of adoration only in Khushwant Singh and this grew in me the love for my birthplace, Hadali, also. I learned the love for my mother land from Khushwant Singh. I salute the greatness of Khushwant Singh for this love and adoration for his birthplace. 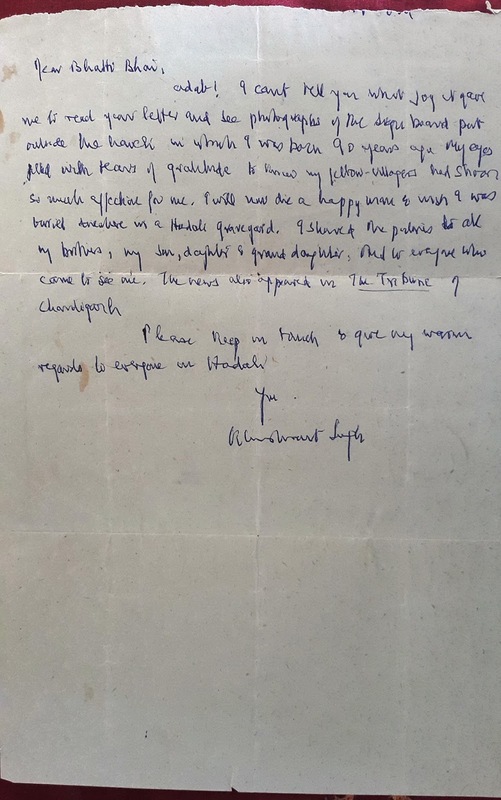 What was my relation and connection with Khushwant Singh? Its simple answer is that the same relation and connection, which exists between two fellow citizens. The soil of which Khushwant Singh was created, I was created from the same soil. 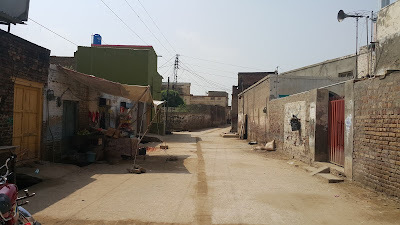 The village where Khushwant Singh was born, the alleys where he played, I also spent my childhood, plying in the same alleys. The school in which he studied, I studied at the same school. Khushwant Singh was a writer and I too have connection with literature. I am the only man of Hadali, who when once went to Chandigarh, Khushwant Singh specially came to meet me from Delhi. We had an exchange of letters for a long time and we kept in contact till his death. I have kept safe the piece of cloth as a remembrance, in which his ashes were brought to Hadali. I also had had the honour of holding the first condolence meeting in his memory after his death, in the world. Pakistan’s renowned writer, journalist, intellectual and Khushwant Singh’s friend Farrukh Sohail Goyndi and senior journalist Syed Taseer Mustafa were also present in it. It is a matter of pride for us that India’s well known columnist and senior journalist Kuldip Nayar, especially paid his tributes live from India on telephone. The love of his fans was worth watching during the condolence meeting. Khushwant Singh was a loving man, who gave the message of love and peace to the world and taught people to love their birthplace and roots. In his writings you can find fragrance of love with ones homeland and at places he has expressed his love for his birthplace with great devotion. 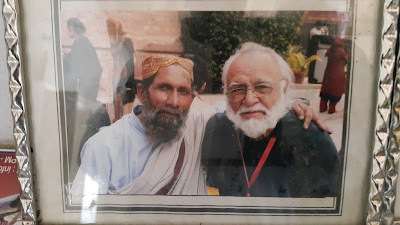 After his death when his son Rahul Singh, daughter Mala and Indian journalist Nilofar, came to Hadali with Syed Fakir Aijazuddin, I asked Rahul that what Khushwant Singh used to say about Hadali. He replied quite frankly that his father’s first and last love was Hadali. Khushwant Singh was often criticized, many accusations were levelled against him, he was given different kinds of titles and was abused excessively, people slandered him, but he remained oblivious to all this and remained focused on his own path. Khshwant Singh was a bold, open and pure human being. Miles away from hypocrisy, a preacher of love and peace, who had no hate or lies hidden in him. He presented the summary of his life experiences in his writings to the world. However, after all he was a human being, if he had some faults, he had many virtues too. Whereas he was a controversial figure due to his bold writings, and thousands of people were against him, at the same time there were hundreds of thousands persons in this world who were his fans and loved his writings. No doubt Khushwant Singh was a twentieth century’s great intellectual, columnist and writer. Khushwant Singh will be at the top of the list if we mention a few great literary persons of the twentieth century. I am rightly proud of the fact that not only this great writer belonged to my city Hadali but I had personal acquaintance with him and people of Hadali also loved him very much. Proof of that can be seen in the condolence book. Our local teacher Rana Muhammad Aslam is such a huge fan of him that he has read all of his books. Khushwant Singh could not read and write his mother tongue Punjabi, but could speak and understand. 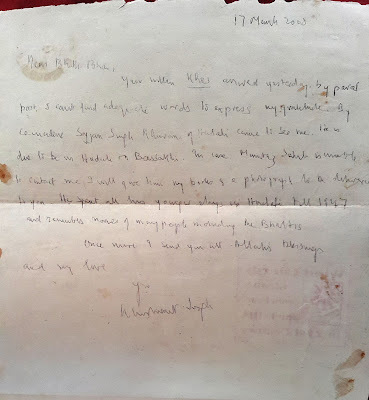 Though he chose English as his medium of expression, but he adored Punjabi and we often kept in touch through letters. Occasionally we spoke on telephone and he always spoke to me in Punjabi, as I too prefer Punjabi language. Once I mentioned to Khushwant Singh that he always spoke to me in Punjabi, on that I not only feel proud, but also feel good at heart and happy. He replied that Bhatti, it is always enjoyable to speak to your own people in your own language and I always speak with my Punjabi friends in Punjabi. I say this with full confidence that if there were fifteen to twenty more persons like Khushwant Singh in India and Pakistan, there would not have been the curse of terrorism in this area and this area had not only been abode of peace and tranquillity, but there would have been prosperity all around and both countries would have been living like great and peaceful neighbours. But alas there was only one Khushwant Singh in the world. As I mentioned above the exchange of letters between Asad Bhatti and Khushwant Singh started in 1990. Asad Bhatti over the years received almost a dozen letters from Khushwant Singh. Asad suspects that some of his letters did not reach him. On my second visit, he showed me the following four letters. But it proved to be very difficult for me to read them and I could not read a few words at all. Even Asad Bhatti could not help me in this matter. written it for over 55 years & find it difficult to get back to it. on the outer wall of the haveli in Hadali where I was born in 1915. ____ away to the hills for the summer months. _______ _______ possible, I would like to be buried in Hadali. regards to everyone in Hadali. I can send as I need to keep them till I die – which is not be long. correspondent in Delhi. Also in some Hindi Papers. my love to all my fellow villagers. The above four letters tell a lot about Khushwant Singh's deep attachment and tremendous love for his ancestral village. Asad Bhatti sahib told me that he had 9 letters in all. He is not very much familiar with English, so some of them were lost when he gave the letters to people for reading. Khushwant Singh had immense love for his birthplace. But despite his extreme fondness, circumstance permitted him only once to visit his beloved Hadali and that was in 1986. Indian Sikhs complain that after the murder of Indira Gandhi violence is being perpetrated against them without justification. I consider Pakistan my country, In India, I have always been considered a Pakistani. 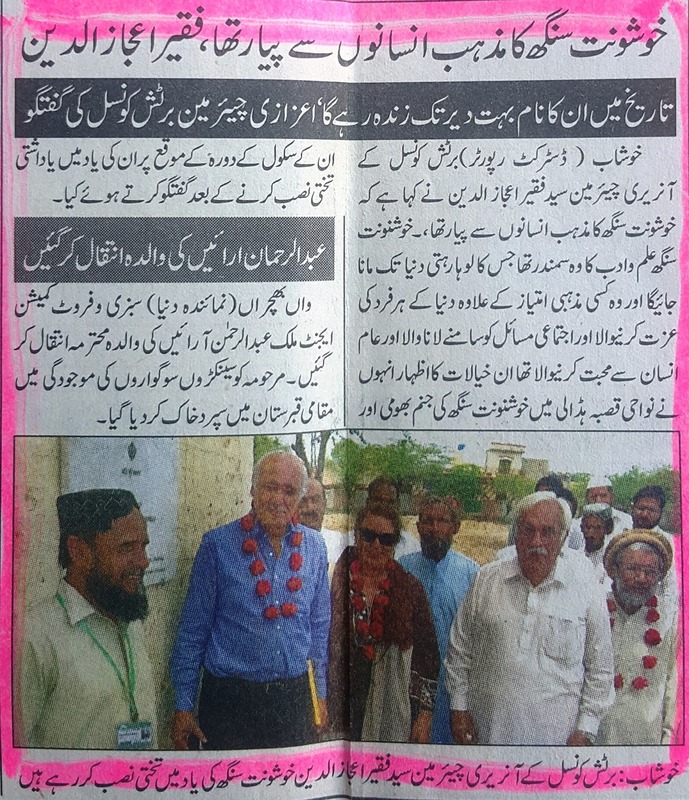 Khushab 10 December (Correspondent). 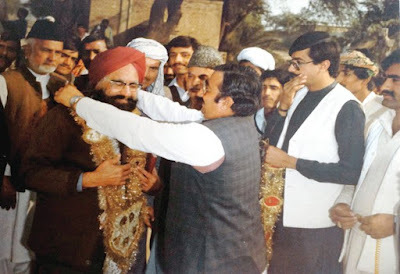 Ex-member of India's Rajya Sabha and ex-editor of Hindustan Times Khushwant Singh has said "Hadali is my ancestral town and in that relation, its importance to me is no less than the Holy Ka'ba has for the Muslims. And coming here has given me the same pleasure which a Muslim gets after Haj or Umra ......... Rest on Page 9 Column 6. I have taken the above three pictures from The Express Tribune, written by Mr Tariq Masood, published June 15, 2004. Khushwant Singh addressing the gathering at the Government High School, Hadali. A local garlanding Khushwant Singh on his arrival in Hadali. Singh in a group photo taken at the Government High School, Hadali. Khushwant Singh was never able to visit Hadali again. He wanted to be buried in Hadali and expressed this wish many times. After his death on 20 March 2014, in respect of his wish his close friend Fakir Syed Aijazuddin brought a fistful of his ashes to be buried in Hadali. Translation: By the writer of this post. Khushwant Singh was a South Asia's controversial but most widely read writer and journalist. He was born on 2 February 1915, in Pakistan's province of Punjab, at Hadali in district Khushab. His father Sardar Sobha Singh was a government contractor, and their's was an affluent family. Khushwant Singh got his education till primary level from the government school. This school was established in Hadali in 1865, now it has become a high school. After completing his education till primary level, Khushwant Singh moved with his parents to Lahore and then to India. Before the occupation of the British Calcutta was the capital, when the British made Delhi the capital, Sardar Sobha Singh, father of Khushwant Singh got all the contracts for the new construction. Hence a large portion of New Delhi was constructed by Sardar Sobha Singh. Great love for his birthplace was perhaps inherent in Khushwant Singh. He always mentioned his birthplace with love and reverence. He was desirous of seeing his birthplace again. But due to his busy life, could not fulfil his desire. He came to Pakistan several times but unfortunately could not come to Hadali. But then an incident happened which paved his way to come to Hadali. Once he went to Bahrain to attend a programme, there a policeman belonging to Hadali, Haji Ahmad Nawaz Awan checked his passport. On passport the birthplace was given as Hadali, Ahmad Nawaz told him that he too belonged to Hadali. Khushwant met him warmly and informed him about his old wish to come to Hadali. Just at this point, Khushwant Singh planned to visit his birthplace. At last on 10 December 1986 he was in Hadali. It was Zia ul Haq's era of government. Colonel Gul Hayat, who belonged to Hadali, brought him from Lahore to Hadali, where the whole city turned out to see Khushwant Singh. Every person wanted to see and meet him. 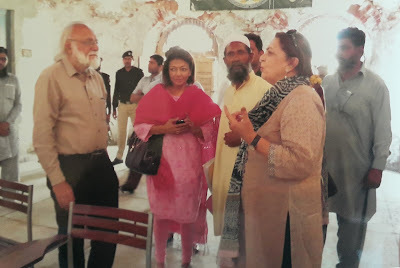 By chance a few persons who knew Khushwant Singh from his childhood days were also present, including Haji Muhammad Hussain Awan, Malik Mir Baz and major Allah Bakhsh Tiwana. They all were Khushwant Singh's neighbour. Khushwant Singh was very happy that day. A function was arranged in his honour in tje ground of the School. 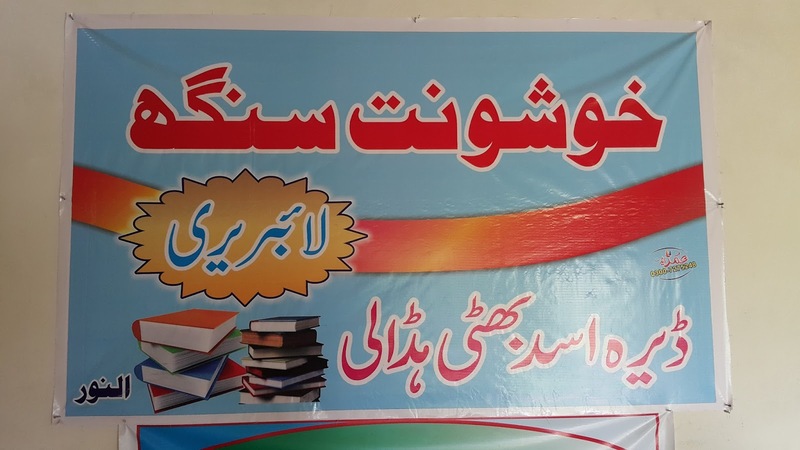 Chairman of Hadali Malik Khuda Bakhsh Wadhal, Muhammad Tahir Awan Advocate, Haji Muhammad Hayat the headmaster of the school and many other persons attended the function. They all paid their tribute to Khushwant Singh for his great love for Hadali. While addressing the function Khushwant Singh got very emotional, on one side he was very happy to see his birthplace and on the other side, he was very sad, missing his childhood days and for having to leave his city and go away. In this state of conflicting emotions of happiness and sadness, in his address, he said to the participants "just like Muslims who go for Haj and Umra and consider it as a great blessing, exactly similar are my feelings today. I think today by seeing my birthplace I have performed my Haj as well as Umrah." He clearly expressed his love for Pakistan and Hadali. He said that it distressed him very much when Indian newspapers wrote against Pakistan. He considered Pakistan as his home. That's why many Indians were unhappy with him and called him an agent of Pakistan. 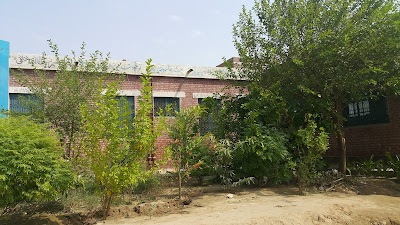 He pointed towards the hall of the school and said that that was the building in which he studied and the assembly was used to be held. At this point probably the childhood memories overwhelmed him completely and tears started flowing and he could not continue his speech and came back to his seat weeping. He had to return to India within a day, but he went back with the promise of returning soon. But he never got a chance to come back. 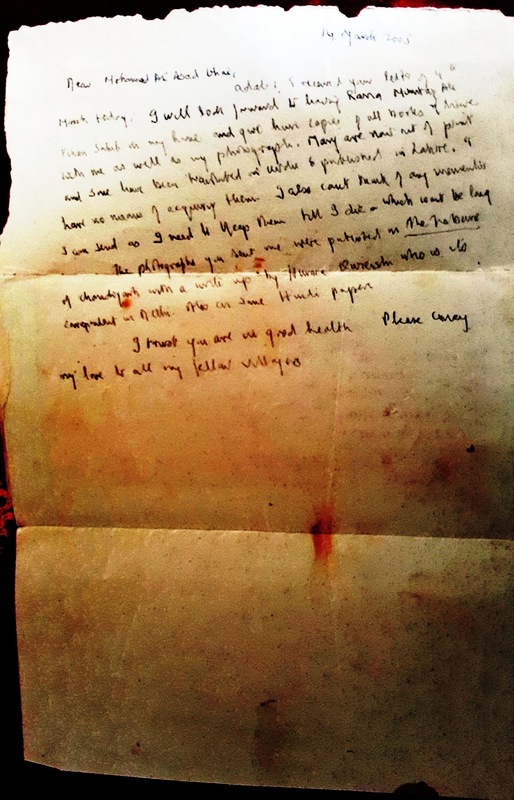 Many years passed, he remained in touch with a few persons of Hadali, through letters. One of them is Muhammad Ali Asad Bhatti, a man of letters. His fans of Hadali sent him a gift of a traditional shawl as a gift. 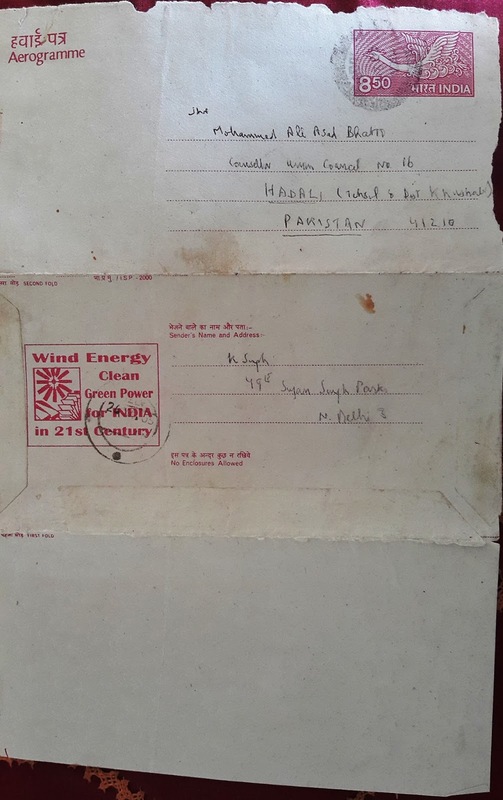 The special thing about this gift was that along with it, there was a piece of white cloth measuring two yards, on which there were signatures of 150 residents of Hadali, with good wishes for Khushwant Singh. People of Hadali expressed their love for Khushwant Singh through this gift. 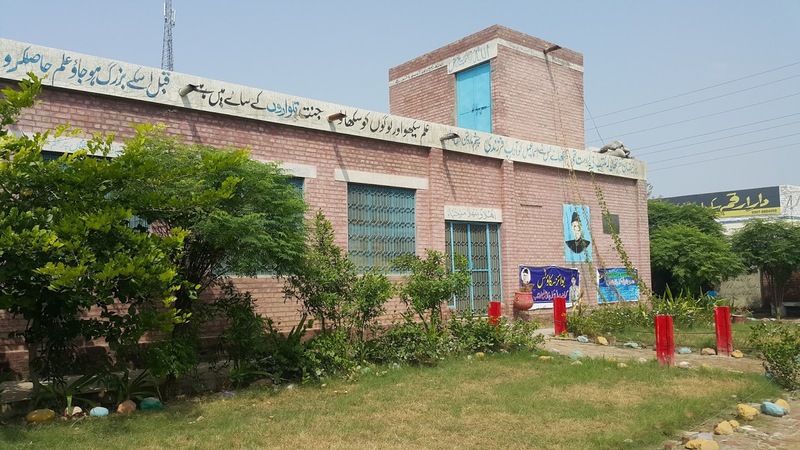 Hadali's famous literary figure Muhammad Ali Asad Bhatti told that he along with some other people had planned to celebrate his diamond jubilee on the occasion of his 100th birthday. Preparations were under way when by a phone call a sad news was received that Khushwant Singh was no more in this world. Whoever heard this news in Hadali, felt that as if his own brother had died. The atmosphere of the whole city became gloomy. 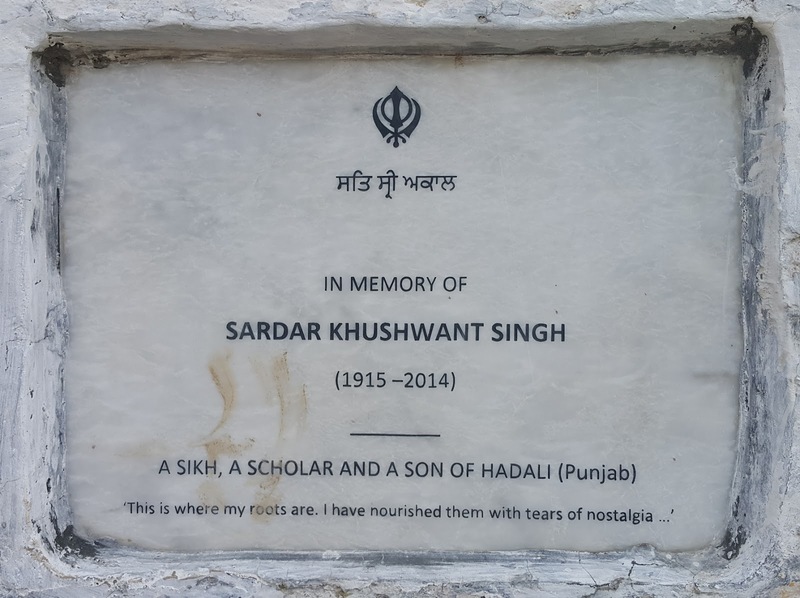 Residents of Hadali held a special reference in the memory of their beloved Khushwant Singh. The reference was presided by Deputy Commissioner of Khushab. Farrukh Goyandi and Mustafa Taseer, specially came from Lahore. A special thing about this reference was that well known journalist of India Kuldip Nayar, addressed this reference live on a phone. At the request of people, he addressed in Punjabi. He said that Khushwant Singh was his friend and teacher. He praised people of Hadali for their love for Khushwant Singh. Khushwant Singh's infatuation can be judged by the fact that before his death he expressed in his will that his ashes should be sent to his birthplace Hadali after his death. 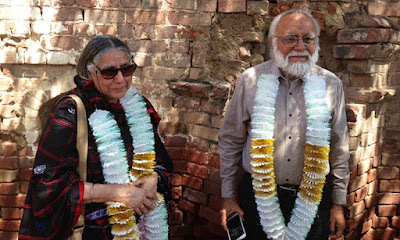 In respect to his will, Syed Fakir Aijazuddin and his wife Shahnaz, brought his ashes to Hadali on 22 April 2014. A commemorative plaque was fixed on the wall of the main hall of the school in Hadali. The ashes of Khushwant Singh were mixed with the cement, used to fix this plaque. It was a wish of Rahul Singh, Khushwant Singh's son to bring the ashes by himself, but due to ill health, he could not come. He gave this responsibility to Syed Fakir Aijazuddin. At the occasion of fixing the commemorative plaque the headmaster of the school Muhammad Farooq Rana, Muhammad Ali Asad Bhatti, Malik Muhammad Qasim Wadhal, ex-headmaster Haji Muhammad Hayat, school's teachers and citizens were present. When the ashes of Khushwant Singh reached Hadali, the ex headmaster Haji Muhammad Hayat spontaneously uttered, "After 99 years a son who greatly loved his birthplace has returned to his soil." Till today residents of Hadali remember their beloved Khushwant with moist eyes. 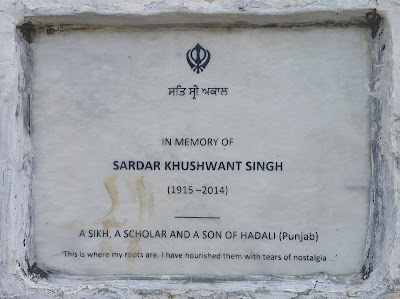 Under the same Rosewood tree, where Khushwant Singh used to play during his childhood, it is written on the commemorative plaque, "A Sikh, a scholar and a son of Hadali." 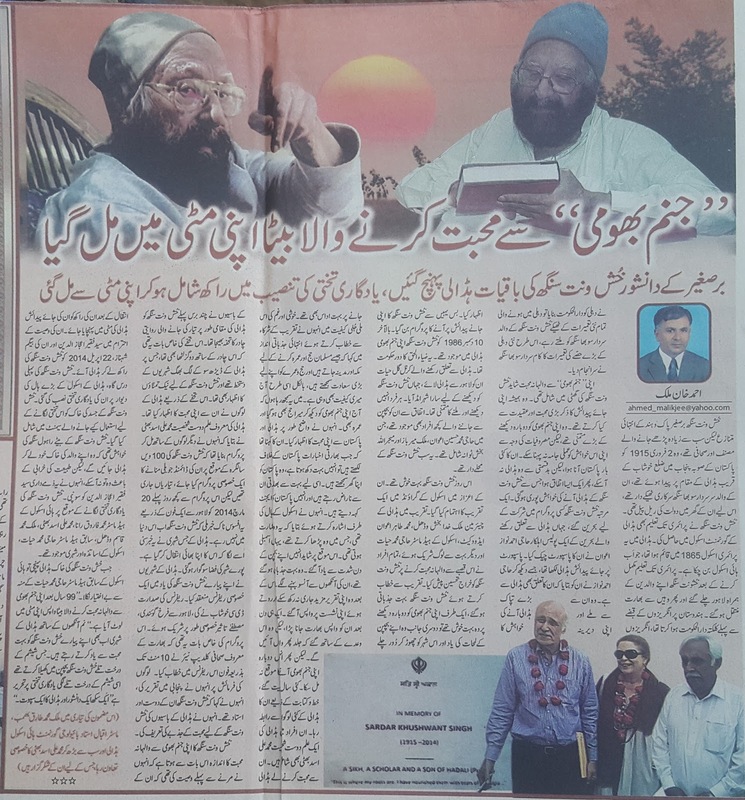 An article by Syed Fakir Aijazuddin, a close friend of Khushwant Singh. 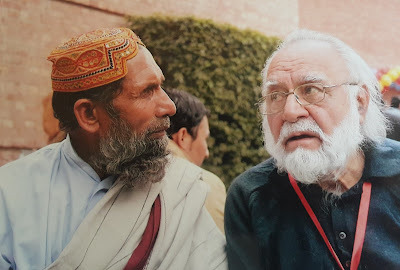 Khushab (District Reporter): The honourary chairman of the British Council Syed Fakir Aijazuddin said that the religion of Khushwant Singh was loving human beings. Khushwant Singh was such an ocean of knowledge and literature, who will be remembered for ever. He respected each and every person irrespective of his religion and was a person who brought forth the collective problems and a person who loved ordinary people. He expressed these views after visiting Hadali, the birthplace of Khushwant Singh and fixing commemorative plaque in his memory. Aziz ur Rehman - Express Tribune: May 6, 2014. Every person has natural love for his homeland or birthplace. This love becomes deeper if he has to leave his birthplace. Whereever he may live, he misses his birthplace and it creates an unknown kind of longing in his heart. Khushwant Singh bore this longing for his whole life and died in Delhi in 2014. 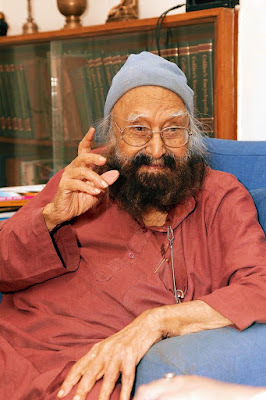 Khushwant Singh was a subcontinent's well known writer, columnist and historian. Before joining India's foreign service, he practiced law in Lahore High Court for several years. He started his career as a journalist from All India Radio in 1951 and worked in serveal newspapers and magazines. 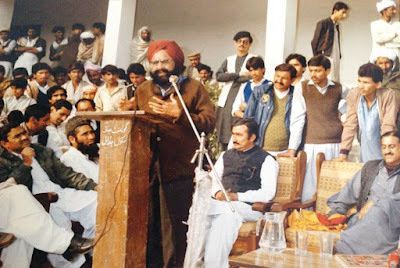 Khushwant Singh remained a member of Rajya Sabha from 1980 - 1986. In 1974 the president of India awarded him "Padma Bhushan", which he retunrned in 1984 to prtotest against the action taken against the Golden Temple. His colum in Hindustan Times was very popular. He could not expel memories of his birthplace, Hadali, from his heart till his death. 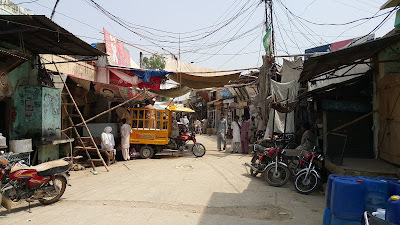 Pakistan's town Hadali, inititially was in district Shahpur. Later on in district Sargodha and currently it is in district Khushab. 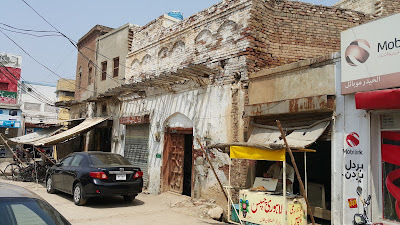 It is at a distance of 12 kilometers from Khushab on the Minawali road. Its population is about 60 to 70 thousands. Besides Khushwant Singh many famous perosnalities were born in Hadali, including former federal minister Nilofar Bakhtiar and the former Chief Justice of the Lahore High Court, Abdul Majid Tiwana. Famous miscreant Chiragh Bali also belonged to Hadali. Two movies were made on Chiragh Bali. In both the films the character of Chiragh Bali was performed by Sultan Rahi. First movie was made in 1976, with the title of "Chiragh Bahdur". It was a black and white film. The second film was made in 1991, with the title of Chirgh Bali, which was in colour. When Khushwant Singh came to his ancestral town Hadali, in 1986, a function was arranged in his honour. In this school he had received his primary education. At that time it was a primary school. 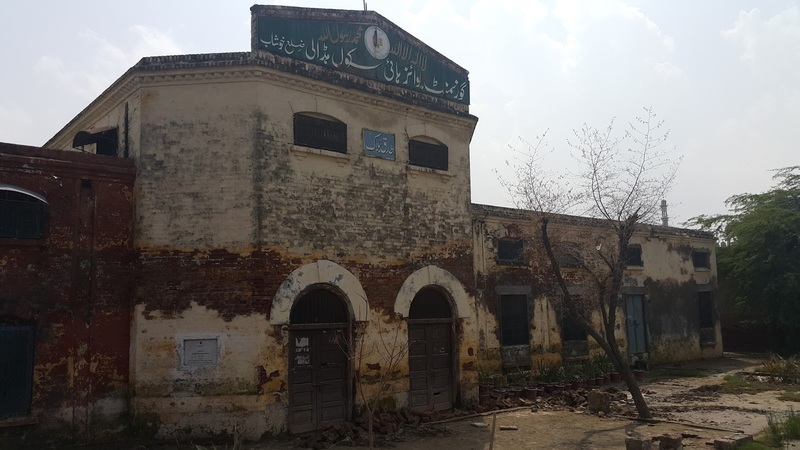 Its name was Anglo-Vernacular School, which was established by Sikhs in 1828. Later on it was given the status of a high school. Khushwant Singh said in his speech "Its importance is no less than Muslims' Kaaba to me. Icannot fully express my happiness for coming here". 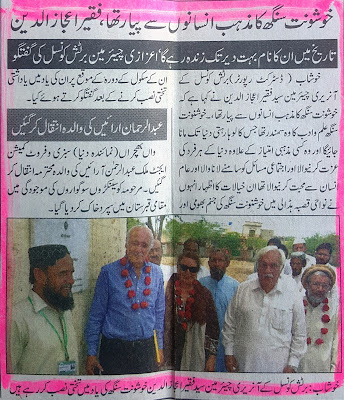 Report of this function was published on 11th December in Nawa-i-Waqt. It was written in the report that Khushwant Singh said that whenever something was writtern in Indian newspapers, it hurts his feelings, because he considered Pakistan as his country. (He said) "That's why I always have been considered a Pakistani in India". At this point he could not control his emotions and tears started flowing and he finished his speech. 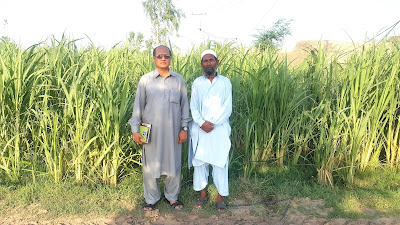 Well known poet of Punjabi, an author and a very dear friend of mine Muhammad Asad Ali Bhatti is a resident of Hadali. Muhammad Asad Ali Bhatti went to Chanidgarh, India, to paticipate in Punjabi Conference in 2003. He had had correspondence with Khushwant Singh. Due to not having the visa for Delhi he could not meet Khushwant Singh. He called Khushwant Singh on telephone in Delhi, he came to Chandigarh from Delhi, to meet him. Bhatti sahib told me that Khushwant Singh gave him some of his books and kept asking about Hadali. I informed him that the house in which he was born, then had turned into a ruin. Bhatti sahib said that Khushwant Singh was a writer of English language, but did his conversation in Punjabi and was a very open minded person. 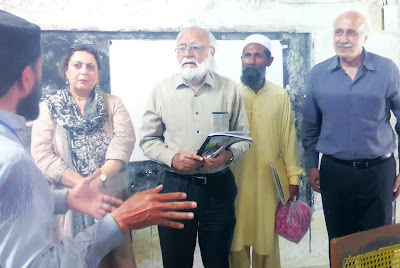 Asad Bhatti, under the patronage of Sanjh, a literary society, arrnaged a condolence reference, which was presided by Malik Muhammad Tahir Awan Advocate. This is the same Tahir Awan, who hosted a lunch for Khushwant Singh at his residence in 1986. The headmaster of the school Rana Muhammad Farooq recalled the memories of Khushwant Singh. Muhammad Ali Asad Bhatti informed that when on the day of his only son's wedding, he received the news of Khushwant Singh's death, it mixed sadness with happiness. Asad Bhatti has the honour of presenting a bouquet to Fatima Jinnah, when she came to Hadali, during her election campaing against Ayub Khan. Asad Bhatti was then five years old. A worker of Pakistan Movement Nawab Mumtaz Muhammad Khan belonged to Hadali. It is said that once Allam Iqbal came to Hadali to meet Nawab Sahib. 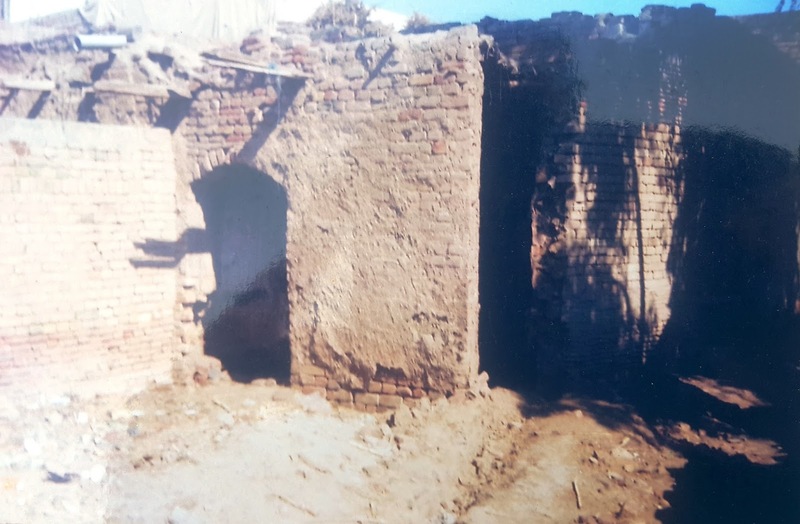 During the government of Pervez Musharraf, Indian High Commission in collaboration with the district government, fixed a board announcing to preserve the house of Khushwant Singh, but it could not get any further. 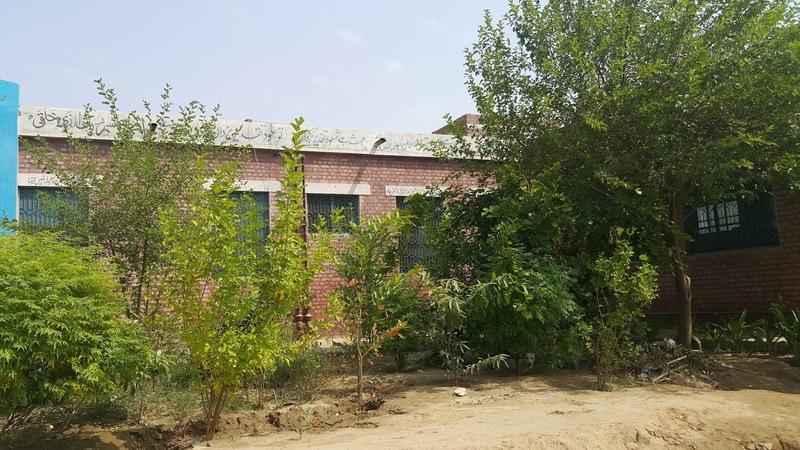 Following three pictures were provided to me by Asad Bhatti, when I visited him the second time on July 7, 2017. 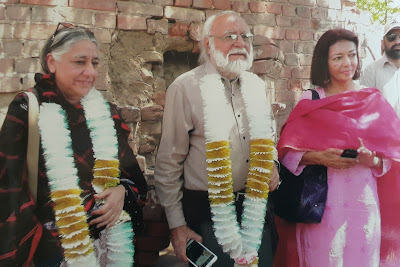 Asad Bhatti has a small collection of these pictures, which were taken in Lahore, when Rahul Singh came to attend Lahore Literary Festival in 2015. 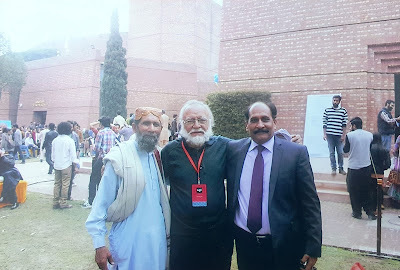 Asad Bhatti and Rahul Singh at Lahore Literary Festival in 2015. Below is another aricle written by Fakir Syed Aijazuddin about Khushwant Singh. Hadali is not an easy place to find on the map. Click the cursor after tracing Khushab and you have not reached it; shift the cursor forward a millimetre and you have missed it. The only way of locating it is by using eyes moistened with nostalgia and a heart installed with a homing instinct. The Hadali of Khushwant Singh’s green days is now a nondescript small town, better known like Stratford upon Avon for its son that for itself. 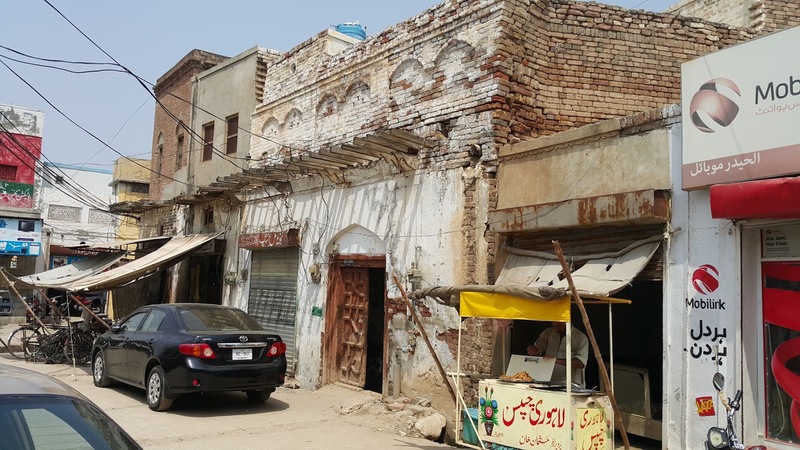 To reach Hadali, one has to drive 256 kilometres from Lahore, along the M-1 Motorway in the direction of Islamabad, then take the N-60, cross the river Jhelum, go through the district headquarters of Khushab until a small modest sign on a ribbon road marks the turning for Khushab. Khushab is not the tiny hamlet Khushwant was born in a century ago, nor is it today what he revisited in 1987. It is a community determined to improve itself, to remould its rural vowels to make it sound more like a modern, urban babu. I knew (who didn’t) that Khushwant Singh had an umbilical connection with Hadali. When I met him for the last time in his Sujan Singh Park flat on 4 March 2014, he told me that he wanted his ashes interred in Hadali. He died a fortnight later. His dying wishes became less of a mission for me than an act of homage I, as one of his numerous acolytes, could offer him. To return him to Hadali was to complete the cycle of his life that began in a small brick house in one of Hadali’s congested lanes to end in the brick wall of his first school in Hadali. When I spoke to his daughter Mala on 21 March 2014 to condole his death, she had just returned from the Lodhi crematorium with his ashes. I told her of Khushwant Singh’s last wishes. She and her brother Rahul agreed to save some of their father’s ashes for me to take to Hadali. As a Pakistani, to visit Hadali, all I had to do was to speak to some-one senior in the Punjab Government who spoke to his subordinate, who instructed his underling, who ordered the District Coordination Officer (DCO) in the field to make the necessary arrangements. 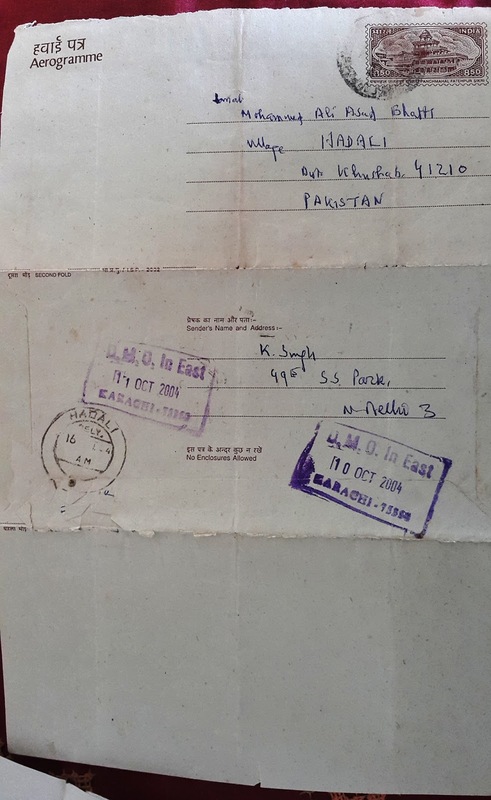 I collected Khushwant Singh’s ashes from Mala in New Delhi on 18 April 2014, took the small steel urn which bore the label ‘Good Life’, travelled by train to Amritsar, crossed the border with them, and then drove on 22 April to Hadali to instal the marble plaque I had commissioned. For rustics, local births, marriages and deaths are the protruding knolls in the barren landscape of their level lives. Visits of celebrities, like visits of royalty (in Malcolm Muggeridge’s words) are not to be expected but to be enjoyed when they occur. For Hadalians, Khushwant Singh’s return in 1987 became an excuse for a public, civic celebration. All he wanted to do was to reconnect with his cradle in silent privacy. Instead, he found himself shedding his ‘tears of nostalgia’ in public. My experience almost thirty years later with a younger generation of Hadalians proved to be no different. They flattered me with undeserved attention, feasted me, surrounding me with an unbroken ring of attention. I broke through it and shooing inquisitive onlookers away, I made the local mason mix Khushwant’s ashes in the cement and grout the marble plaque in the outer wall of the shabby but still functional school. The rest of the ashes I scattered in the slow-moving waters of the nearby river Jhelum. I was all too aware that whatever obsequies I could perform for him were as a proxy for his natural children, Rahul and Mala. I was conducting no more than a dress rehearsal. In February 2015, they came to Lahore to attend the Lahore Literary Festival. I tried to repeat the bureaucratic rope trick of my earlier visit to Hadali. On this occasion, though, the harder I tried, the tighter the bureaucratic knots fastened. Didn’t I know that Hadali was located in a security zone? How could they as Indian nationals go to Hadali without specific authorisation? They returned to India disappointed. Within a few months, they made a second visit to Pakistan, this time armed with the requisite visa. Rahul, Mala, Niloufer Billimoria, my wife Shahnaz and myself drove to Hadali in a convoy. We took them first to the Boys’ School where the plaque had been installed. I had brought along some rose petals for Mala and Rahul to place on the narrow ledge at the base of the plaque. Each of us stood before the plaque and honoured Khushwant in his or her own personal way. 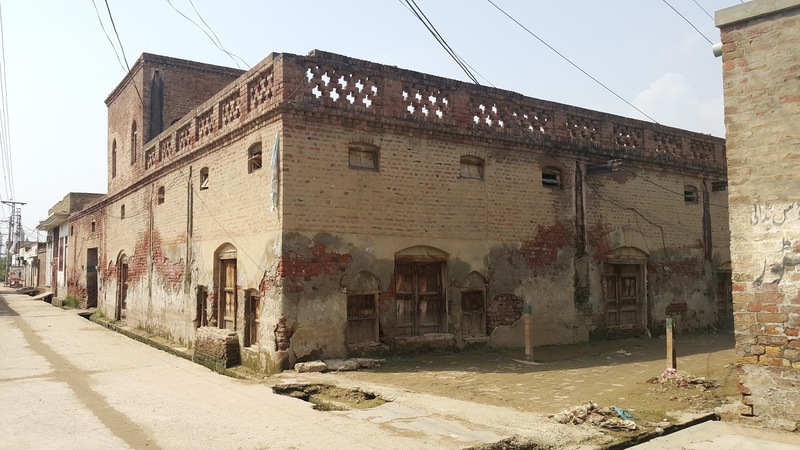 We toured the school, met classes of nonplussed boys and their distracted teachers, and were then escorted through the winding lanes to Khushwant’s Singh’s house. 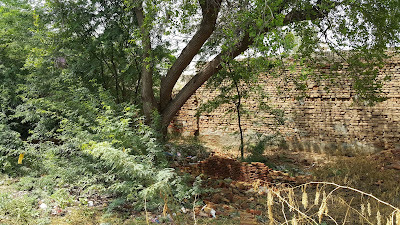 From my earlier visit, I had taken away a single brick as a memento for Rahul. At the KS Litfest in Kasauli, I presented it to him in a deceptively fancy red velvet box. In a sense, it was the nearest equivalent I could think of to the fragments of masonry that were once part of the Berlin Wall, dividing West and East Germany. 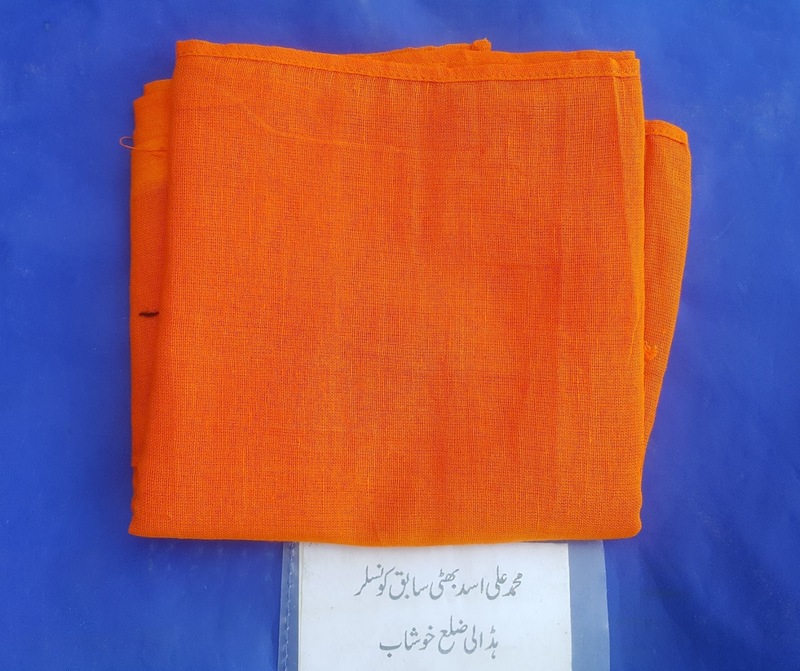 A piece of cloth in which ashes of Khushwant Singh were brought to Hadali. In possession of Asad Bhatti. 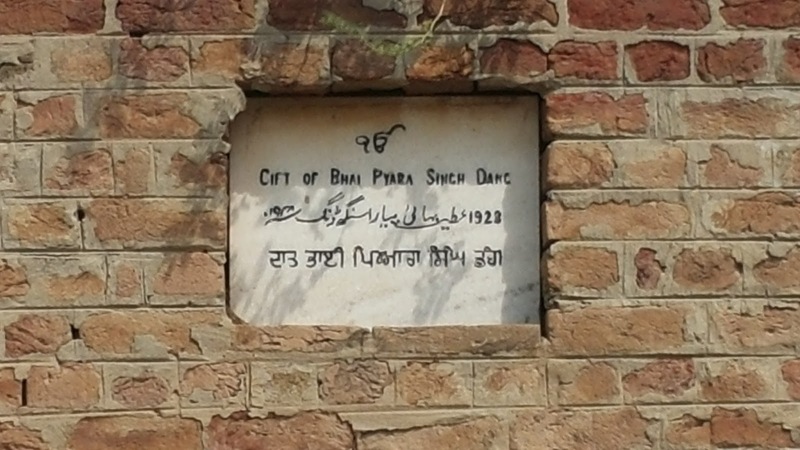 Commemorative Plaque, at Govt. High School Hadali. There so many things to write about the loveable personality of Khushwant Singh, that I felt it difficult to make my selection. I am selecting just a few words from the following links for my friends. Pakistan occupied a special place in my father’s heart. Indians who suffered from the 1947 Partition of the sub-continent can be divided into those who were so embittered that they developed an almost visceral hatred for Pakistan, even for Muslims. They were the large majority, particularly the north Indians. But there was a minority whose compassion overcame that terrible time and who made it their goal to try and promote amity between India and Pakistan and to further friendship between Hindus, Muslims and Sikhs. My father was one of that minority. His critics often said that he should go back to Pakistan! Indeed, he always said that he felt he belonged to Hadali, the village in Pakistan's Punjab, where he was born and went to school. The ashes were taken to Pakistan by author and art historian Fakir Syed Aijazuddin, to whom Singh had mentioned just over a fortnight before his death that he had a desire to be buried in his ancestral village. "I had met him (Singh) in Delhi on March 4 when I had gone to give him a copy of my latest book The Resourceful Fakirs, which is about my ancestors who served as courtiers in the Sikh Darbar of Lahore," Aijazuddin, who had known Singh since the early 1970s, told Mail Today. "Khushwant sahab said, 'I was born in Hadali and I'm a Pakistani by birth.' He said he had told his children that he'd like to be buried at Hadali." When Aijazuddin called Singh's daughter Mala to offer his condolences after the eminent author died on March 20, "I said if you could spare some of his ashes, would you allow me to bring them to Pakistan. She spoke to her brother Rahul and said we have kept a portion for you, take them whenever you come to Delhi." 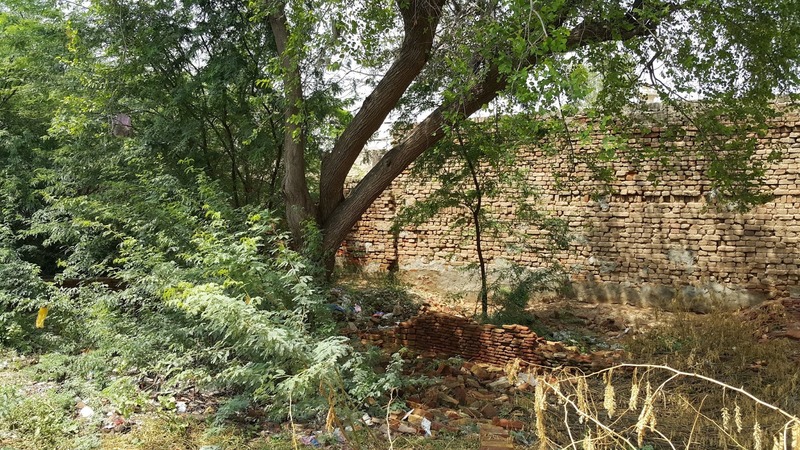 On their last meeting on March 4, Singh had told Aijazuddin that he wanted to be buried in his ancestral village in Pakistan. I knew for a long time that Khushwant Singh was a great and very popular writer. 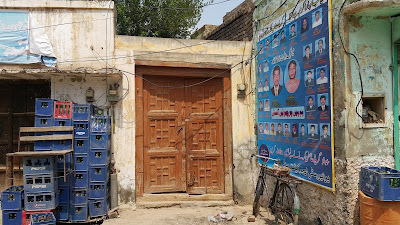 But while writing this post I learned that he was even a greater human being and his love for his land of birth was immense and his doors were always open to any visitor from Pakistan. And this was a man whom nobody could meet without an appointment, even if he was the prime minister of India. Khushwant Singh was not the only person, who harboured such kind of feelings. 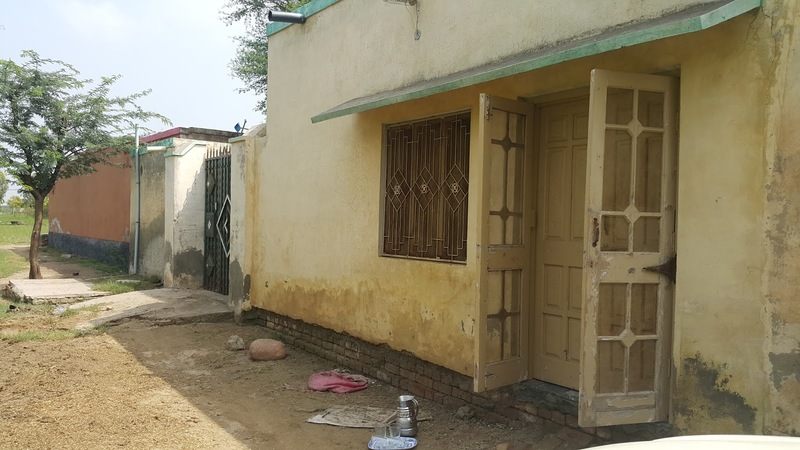 There were millions, who had had to leave their homes at the time of partition and throughout their lives, they never forgot their villages and homes. I dedicate this post to all of them. It is also a story of a friendship between Khushwant Singh and Asad Bhatti. Despite many differences like age, religions country etc. they maintained this friendship for over two decades. They met only once, but still the passion with which Asad Bhatti talks about Khushwant Singh is remarkable. Asad Bhatti is struggling to maintain a small library in memory of his friend in Hadali. I wonder if we could assist him in doing so, and by that preserve the memory of a great son of this soil. Krishen Niwas in Miani, Pakistan.